There are three Flag Acts in U.S. history with the first one spanning from 1777-1794, the second from 1794-1818 and the third from 1818 to the rise of sectionalism. These three sets of laws were set up to define the design of U.S. flags and each of the Flag Acts are particularly short and are only a few sentences long. 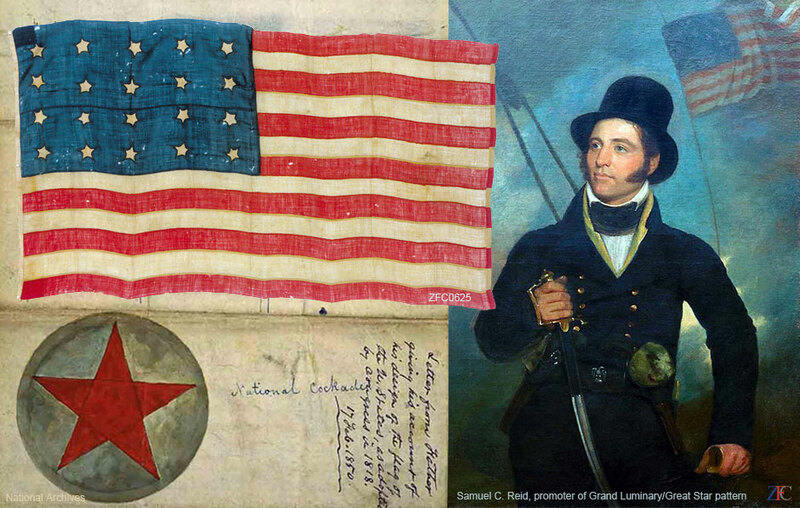 The third and final Flag Act of 1818 was an attempt to impose standardization on the United States flag. By reverting to the original 13 stripes but authorizing the star field to include a new star for each state, the nation was symbolically acknowledging that as territories became states they were equal to the original 13 that created the Union . "On the admission of every new state into the Union, one star be added to the union of the flag; and that such addition shall take effect of the fourth day of July"
However, the third Flag Act left star patterns to the whim of the individual makers, and thus there are many United States flags that have many different designs as makers were free to use their creative talents. Seen in this grouping are the beginnings of the wide array of star-field designs that would be used in the 19th Century.